The Oregon Natural Desert Association’s mission is to protect, restore, and defend Oregon’s desert areas, and ODT users can help us in these efforts. After you travel through these areas and spend extended time in some of these remote and extraordinary desert landscapes, please provide your feedback about the route and consider joining us as a member. To learn more about the conservation priorities at ONDA please browse our website, and spend some time scrolling around our interactive map. The best way we can continue to refine the route is to get your feedback about your experience along the Oregon Desert Trail. In addition, keeping track of water sources on our water chart will go a long way towards building a good picture of water conditions in the desert. Did you see something unique, exciting, or strange? Take a photo and share it with us. Interesting encounters with people along the way? Let us know. In the early stages in the development of a long-distance trail many people who live along the route may be unfamiliar with long distance hiking, and that first conversation with a hiker can pave the way for future hikers’ experiences and supporters of the route. We are still discovering resources along the route to add to our Town & Services Guide, and if someone offers help or a service, let us know and we can include it for future hikers. We’d be interested in hearing about any notable conversations along the way. ONDA has identified wilderness values in areas marked Citizen Proposed Wilderness Areas (CPWA) on the maps, and advocate for protection of these areas with the BLM. The importance of these CPWAs are in the solitude and natural state of the land. We have a photo database of these CPWAs that show these unblemished areas, and invite you to contribute to the effort. For each CPWA you pass through, you can submit up to 5 photos to us to add to this database. Many photos are geo-refenced automatically, but apps are available like Solocator that can include detailed georeferenced data. Many sections along the Oregon Desert Trail route are open to multiple modes of transportation. Hikers will pass through clearly marked OHV trail systems, and on many two-track roads that are still used by vehicles and ATVs. However, if you see areas of clear habitat damage where vehicles have left the roads (especially in Wilderness Study Areas) please let us know and take photo of what you have observed. Every year, ONDA offers dozens of volunteer trips to some of the most scenic landscapes in Oregon’s high desert. With different projects that include removing fence, planting trees, maintaining trail, surveying potential wilderness areas, and monitoring sage grouse breeding grounds, there is an ONDA trip fit for desert lovers of all abilities and ages. Best of all, most trips are free. Join ONDA today to get in on the fun. Interested in giving your high desert adventure a purpose? This program offers volunteers a self-directed opportunity to contribute to important stewardship work to restore Oregon’s high desert apart from ONDA’s group stewardship trips. The organization Adventure Scientists sends thousands of volunteers on missions to collect data from remote, difficult-to-access locations for their conservation partners. In 2013 Sage Clegg collected diatom samples from ODT water sources and helped find several new species on her thru-hike. Contact them to see if there are any projects you could contribute to on your hike in the high desert. Our Public Land Leaders program makes it simple and fun for you to talk with your friends and family about public lands in Oregon’s high desert and encourage others to speak up for our land. By becoming a Public Land Leader in your community, you will encourage new voices to speak up for our public lands. Much of the land along the Oregon Desert Trail is public. As such, the route offers an excellent way to not only learn about our collective landscape within the high desert, but also about the different types of designations that exist, how they are managed, who manages them, and what your role can be in the future of these lands. Understanding how different public lands are managed and how that impacts you and the communities in eastern Oregon is an important aspect of the Oregon Natural Desert Associations’ work. ONDA has been working for 30 years to protect, defend, and restore high desert landscapes in Oregon, and once you spend a day, week, or month on the ODT, we hope you will see the importance in protecting these public lands for generations to come, and for the wildlife that lives there. Throughout the ODT materials you will find references to the different types of management and learn more about each. You will also learn about the particular importance of areas like the Hart Mountain National Antelope Refuge which was created in 1936 as a range for remnant herds of pronghorn antelope, and then broadened to include conservation of all wildlife species characteristic of the high desert habitat and restoration of native ecosystems. The public lands along the ODT are managed by the Bureau of Land Management, U.S. Forest Service, the U.S. Fish and Wildlife Service, and Oregon State Parks. Each of these agencies has their own set of missions, purposes, and goals with unique rules and regulations used to achieve desired outcomes. It is the hiker’s responsibility to become familiar with these rules and regulations as a part of trip preparation. Please take the time to contact the agency that manages the public lands you plan to enjoy for additional information. more often with severely negative consequences for Native people. Settlement of the West, acquisition of the Oregon Territory and Oregon statehood quickly followed and management of Oregon’s land base evolved over decades into the system of private and public lands we know today. The lands through which most of ODT travels came to be a part of the United States and the State of Oregon sometimes by treaty with the sovereign tribal nations that occupied it, but often land was taken by force, confiscation or coercion. This complex, unfortunate and often overlooked history is important to recognize and learn about. Today, Native American tribes and people continue to live in and coexist with lands in Oregon’s high desert. Working to understand this history, the current interests of the sovereign nations in Oregon’s high desert and tribal culture will help your understanding of this region. Hikers along the Oregon Desert Trail will encounter signs of the region’s earliest inhabitants, such as rock art, artifacts and structures left behind. Please note that historic and cultural artifacts are protected by the Archaeological Resources Protection Act and other authorities. It is illegal to remove or disturb archaeological sites, historic sites or artifacts such as pot shards, arrowheads, structures and even antique bottles found on public lands. Please don’t share your discoveries on social media with location tags or specific directions on finding these areas in order to safeguard these locations. These books are just a sample of eastern Oregon literature. Have a resource you would like to share? Email us. 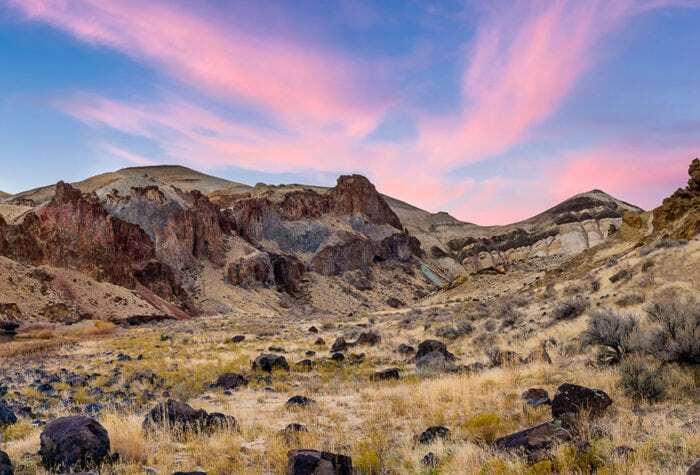 Geology along the Oregon Desert Trail is a glimpse into the relatively recently volcanic life of Oregon. From the largest fault-block mountains in the country, to hot springs, lava beds, lava tubes, and deep fissures in the earth, there is much to learn about the earth’s movement and activity along the ODT. Many people do not realize that deserts are full of life! Oregon’s high desert supports a remarkable diversity of plant and animal species, many of which are unique and endangered. Our high desert is dominated by sagebrush—making this habitat, called the sagebrush steppe, the perfect home for many animals that are dependent on sagebrush for food and shelter. These desert-dwellers are called sagebrush obligate species and include the Greater sage-grouse, pygmy rabbit, sage thrasher, and pronghorn antelope. Eastern Oregon’s wetlands attract tens of thousands of migrating birds, including waterfowl such as sandhill cranes, pelicans, and tundra swans. Important populations of native fish, such as Chinook salmon, steelhead, redband and bull trout ply Oregon’s desert rivers. On warmer summer days the western rattlesnake can be found sunning on rocky outcroppings. Take care when walking through tall grasses; wearing tall gaiters and beating the brush with a hiking stick can prevent unwanted close encounters with these desert creatures. and habitat damage. Consider these guidelines while hiking to respect wildlife and their habitat during your trip. Please do not feed wildlife by hand, and always pack out food scraps and secure food when away from your pack. Human food lacks nutritional value that wildlife need and can digest. Feeding may also habituate wildlife, causing dependence and aggression. Be mindful of quick movements, contact and loud noises, as they can be stressful for wildlife and cause them to use calories they need to survive. Consider this when bringing pets as well. Follow Leave No Trace principles while choosing your path to ensure you are not damaging vegetation in these fragile ecosystems. Respect trail and natural area closures as they may be seasonally protecting wildlife during vulnerable times of year. Eastern Oregon can be described as a “sagebrush sea” and is home to many desert plants and vegetation unique to the high desert environment. There are prime examples of greater sage-grouse habitat in eastern Oregon, consisting of grasses, forbs (flowering non-woody plants), and shrubs. The juniper tree is plentiful, along with mountain mahogany, stands of ponderosa pines, and loads of sagebrush. In the Oregon Badlands Wilderness, with vegetation typical of the high desert region, native plants have adapted to survive on less than 12 inches of rain per year. Spring can bring vibrant wildflowers such as Oregon sunshine, dwarf purple monkeyflower, sulfur buckwheat, Indian paintbrush, and mariposa lilies. Other high desert wildflowers common throughout the region include buttercups, larkspur, phlox, primroses, and coral mallow. The Oregon Badlands Wilderness also contains the oldest known tree in Oregon, a western juniper estimated to be more than 1,600 years old.